A poignantly silly adventure tale for families. Sylvie is sent to the backyard to hang up the laundry. The moment her back is turned, a mischievous squirrel steals her favorite piece of clothing and runs off. When Sylvie gives chase, an entire world emerges from her laundry basket, and curious characters show her the way through mysterious lands. 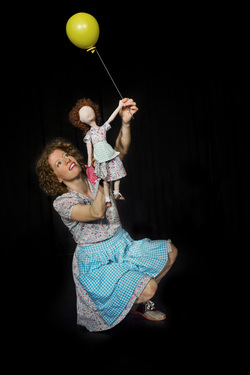 Developed with the generous support of Puppet Showplace Theatre's Incubator program. *This show is a 2013 recipient of a Jim Henson Foundation Family Grant. Download file below for more details or just CONTACT BONNIE! For more information about educational programs, click HERE. SOLD OUT the entire 10 show run!